1. Easy to operate: pressing the RC or tossing the coin to start. 2. The control lever is easily operated. It can be driven at any direction. 3. The amazing sound and deluxe seats can make the customers feel better. 4. 24v storage battery and 24v electric motor for driven. 5. Support MP3 card extended containing 32MB MP3 stereo. 6. Support card through the speaker adjusting the volume. 7. Time can be adjusted and controlled. 8. Colorful LED lights, blade light shining with music. 9. Automatically counting timing system. 10. 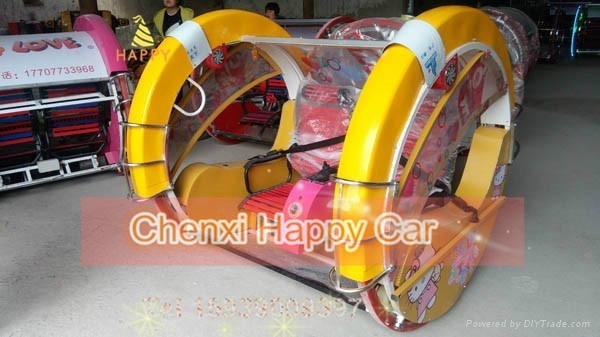 Product suitable for fairground, park, tourist attractions, resorts. 11. Customized according to customs' requirements. 12. Adding coin boxes for tossing.